By Nadiya's Handmade Jewelry consists of a classic mix of American, Asian and Middle Eastern design inspirations. For over 6 years, Nadiya has traveled around the world to carefully select Swarovski Crystals, Lamp Work Beads,Trinkets, Pearls and Semi Precious Stones in vibrant colors. "Creativity is my passion that's reflected in my Jewelry as it redesigns the style of women all around the globe." Nadiya's jewelry designs are intricate and complex, featuring artisan techniques mixed with modern approach to different contrast, color and texture. 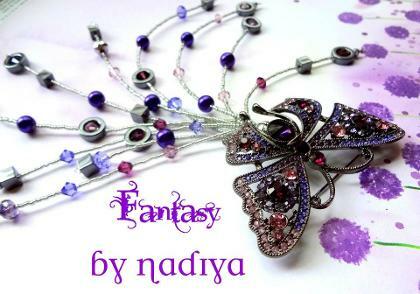 Jewelry created By Nadiya is an exclusive design per piece with no repeats! Each Piece is original and cannot be recreated. Be a Proud owner of one of these stunning Jewels Handmade in USA!